Reading and share top 26 famous quotes and sayings about Darfur by famous authors and people. 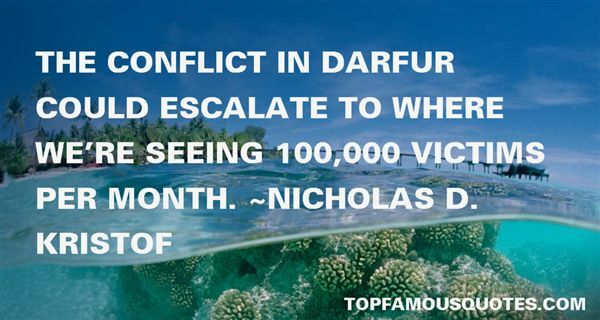 Browse top 26 famous quotes and sayings about Darfur by most favorite authors. 1. "There is a huge trapdoor waiting to open under anyone who is critical of so-called 'popular culture' or (to redefine this subject) anyone who is uneasy about the systematic, massified cretinization of the major media. If you denounce the excess coverage, you are yourself adding to the excess. If you show even a slight knowledge of the topic, you betray an interest in something that you wish to denounce as unimportant or irrelevant. Some writers try to have this both ways, by making their columns both 'relevant' and 'contemporary' while still manifesting their self-evident superiority. Thus—I paraphrase only slightly—'Even as we all obsess about Paris Hilton, the people of Darfur continue to die.' A pundit like (say) Bob Herbert would be utterly lost if he could not pull off such an apparently pleasing and brilliant 'irony." 2. "If the world allows the people of Darfur to be removed forever from their land and their way of life, then genocide will happen elsewhere because it will be seen as something that works. It must not be allowed to work. The people of Darfur need to go home now. I write this for them, and for that day, ... and for those still living who might yet have beautiful lives on the earth." 3. "This morning there s first a predictable story about Darfur; an expert on African affairs notes that seven thousand African Union troops patrolling a region the size of France have been ineffectual in preventing continued janjaweed terror. Funding for the troops is about to run out, and it seems that no one, including the United States, is ready to put forth more money or come up with new ideas to stop the killing and displacement. This is not surprising to those of us who lived through twenty years of oppression by the hands of Khartoum and its militias." 4. "People are interested in crime fiction when they're quite distanced from crime. People in Darfur are not reading murder mysteries." 5. "If NATO goes in and solves the crisis in Darfur, when the next one comes along Africa's leaders will just sit back." 6. "In the time that we're here today, more women and children will die violently in the Darfur region than in Iraq, Afghanistan, Palestine, Israel or Lebanon. So, after September 30, you won't need the UN - you will simply need men with shovels and bleached white linen and headstones." 7. "They traveled deep into far-flung regions of their own country and in some cases clear across the continent. Thus the Great Migration had more in common with the vast movements of refugees from famine, war, and genocide in other parts of the world, where oppressed people, whether fleeing twenty-first-century Darfur or nineteenth-century Ireland, go great distances, journey across rivers, desserts, and oceans or as far as it takes to reach safety with the hope that life will be better wherever they land." 8. 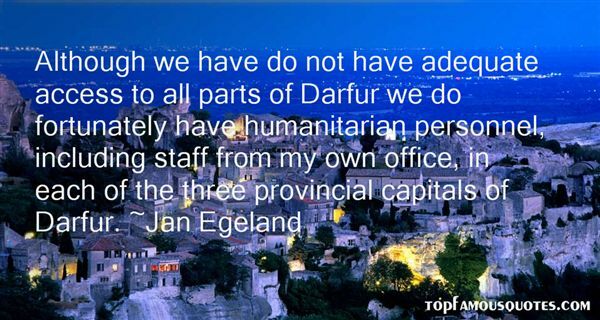 "Although we have do not have adequate access to all parts of Darfur we do fortunately have humanitarian personnel, including staff from my own office, in each of the three provincial capitals of Darfur." 9. "Finally, I am encouraged to note that the Security Council issued a statement today expressing its concern about the massive humanitarian crisis in Darfur and calling on all parties to the conflict to protect civilians and reach a ceasefire." 10. "We estimate that humanitarian agencies have access to about 350,000 vulnerable people in Darfur - only about one third of the estimated total population in need." 11. "We receive reports now on a daily basis from our own people on the ground in Darfur on widespread atrocities and grave violations of human rights against the civilian population." 12. "I was proud to witness American Jewish organizations found the Save Darfur Coalition in June 2004 to mobilize a coordinated interfaith response to the ongoing humanitarian disaster." 13. "As a Jew I cannot sit idle while genocidal atrocities continue to unfold in Darfur, Sudan." 14. "The Coalition for International Justice estimated that 450,000 people in Darfur have died since the deadly genocide began some three years ago." 15. "In all, dozens upon dozens of groups and organizations have prioritized stopping the killing in Darfur before there is no one left to be killed. It is high time that we, the U.S. Congress, join our name to that list." 16. "We need to begin an all-out diplomatic offensive on Darfur in order to prepare the way for a peacekeeping force that can ensure protection for the people of Darfur." 17. "What if I can't save Congo, but I try anyway? Would it be better to do nothing? Did he abolitionists really think they could end slavery? Did the anit-apartheid movement really think it could ban apartheid? Does Save Darfur really think they can save Darfur?" 18. "I knew nothing. Now I've seen what a raw deal lots of other people like Krystal get. And it's not their fault. Not their choice. People don't get to choose what body they're put into. Like, people get born into bodies in the middle of a genocide war in Darfur, and they don't get to worry about how tall they are or whether they'll ever be able to row. They're too busy worrying about how they're going to stay alive for another day." 19. "It really is quite remarkable that Darfur has become a household name. I am gratified that's the case." 20. "While Americans have heard of Darfur and think we should be doing more there, they aren't actually angry at the president about inaction." 21. "The news media's silence, particularly television news, is reprehensible. If we knew as much about Darfur as we do about Michael Jackson, we might be able to stop these things from continuing." 22. "The conflict in Darfur could escalate to where we're seeing 100,000 victims per month." 23. "We all might ask ourselves why we tune in to these more trivial matters and tune out when it comes to Darfur." 24. "Right now, I am in Fallujah. I am in Darfur. I am on Sixty-third and Park having dinner with Ellen Barkin and Ron Perelman... Right now, I'm on Lafayette and Astor waiting to hit you up for change so I can get high. I'm taking a walk through the Rose Garden with George Bush. I'm helping Donald Rumsfeld get a good night's sleep...I was in that cave with Osama, and on that plane with Mohamed Atta...And what I want you to know is that your work has barely begun. And what I want you to trust is the efficacy of divine love if practiced consciously. And what I need you to believe is that if you hate who I love, you do not know me at all. And make no mistake, "Who I Love" is every last one. I am every last one. People ask of me: Where are you? Where are you?...Verily I ask of you to ask yourself: Where are you? Where are you?" 25. "Despite the increase in world attention toward Sudan in the past months, the genocide in Darfur has continued without any serious attempt by the Sudanese government to do what governments primarily exist to do, protect their citizens." 26. "...in the eyes of her oldest friends and colleagues and extended family, she wasn't a painfully thin seventy-five-year-old gray haired woman dying of cancer- she was a grade school class president, the young friend you gossiped with, a date or double date, someone to share a tent with in Darfur, a fellow election monitor in Bosnia, a mentor, a teacher you'd laughed within a classroom or a faculty lounge, or the board member you'd groaned with after a contentious meeting"
This is a spendthrift economy; though nothing is lost, all is spent."